This is an out-and-back mixed ride up Stevens Canyon near Cupertino. It has an "approach" (and return) portion on paved roads, but the rest of the ride extends along Canyon Trail that follows Stevens Creek into Monte Bello Open Space. This was one of my usual weekday-morning rides for a while. The beauty of the route is that you don't need to take the trail all the way to Page Mill Road in order to make the ride worthwhile. You can just turn around from wherever you run out of time or energy. In addition, the ride lends itself well to being done with beginner riders in your group (either new to biking altogether or road riders who are unfamiliar with riding on trails). Because, depending on your starting point, you can extend the paved portion of the ride or the trail portion, and the more physically challenging parts of the ride come further up Stevens Canyon Trail, allowing you to turn back when your fellow riders give up, for a mostly downhill return. Meanwhile, you'd still be allowing them to sample some road riding on a beautifully green canyon road, try a small amount of hillside singletrack, do a creek crossing or two, and try out some fire-road climbs; all on the same (potentially) brief ride. 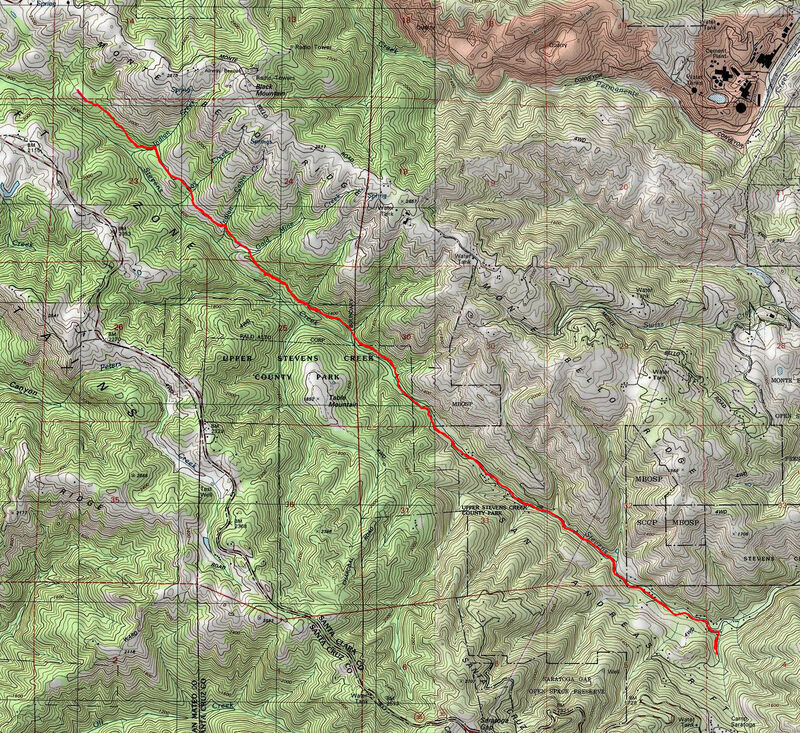 The particular route described on this page begins from a roadside parking spot along Redwood Gulch Road just a hop and a skip off Stevens Canyon Road. There isn't space here for much more than four or five cars, though. This is one of my furthest convenient parking options along Stevens Canyon, allowing me to maximize the trail portion of the ride and minimize the road portion. If you're greedy for even more trail riding, you can try your hand at finding some other spot further up the road, but this is the surest bet that I know of this far up the canyon. Just know that roadside parking is not allowed on Stevens Canyon Road itself. If, on the other hand, you'd prefer to extend the paved portion of the ride as much as possible, there are other parking options along Stevens Canyon Road earlier than this spot. If I were you, I wouldn't park at any spot further back on Stevens Canyon Road than the junction with Montebello Road though, because the stretch of Stevens Canyon Road before Montebello Road sees a lot of quarry truck traffic. It's not fun to share the road with those trucks. There is a picnic area just past that junction, whose roadside parking space is a good option. Riding the paved portion of this route from the suggested parking spot is very easy. The climb, which averages about 2% grade, would be unnoticeable if it weren't for the gentle humps along the way that are comparatively steeper, the worst of which is no worse than 9% grade. Stevens Canyon Road also goes over quite a few bridges (something like 10) before it dead-ends, though you will have left most of them behind your parking spot if you start from the same location as on this ride. The part of Stevens Canyon Road open to regular traffic ends at a gate. You might still encounter a vehicle or two past this spot, but those would only be of people who are from the few private residences past this point on the road and who have a key for the gate. The pavement continues for a very short distance after this gate. Right after you pass over the last bridge in this direction (with a metal grate surface), the pavement quickly dissolves away and you continue on a trail. The first stretch that you cover on the trail is on a fire road with a well established biking line and, therefore, feels a bit like a wide singletrack. This trail initially continues the gentle grade as Stevens Canyon Road. Soon, you arrive at a spot where the trail takes a wide dip and passes by a spot that's noticeably prone to landslides (and that, therefore, has been modified numerous times over the years). 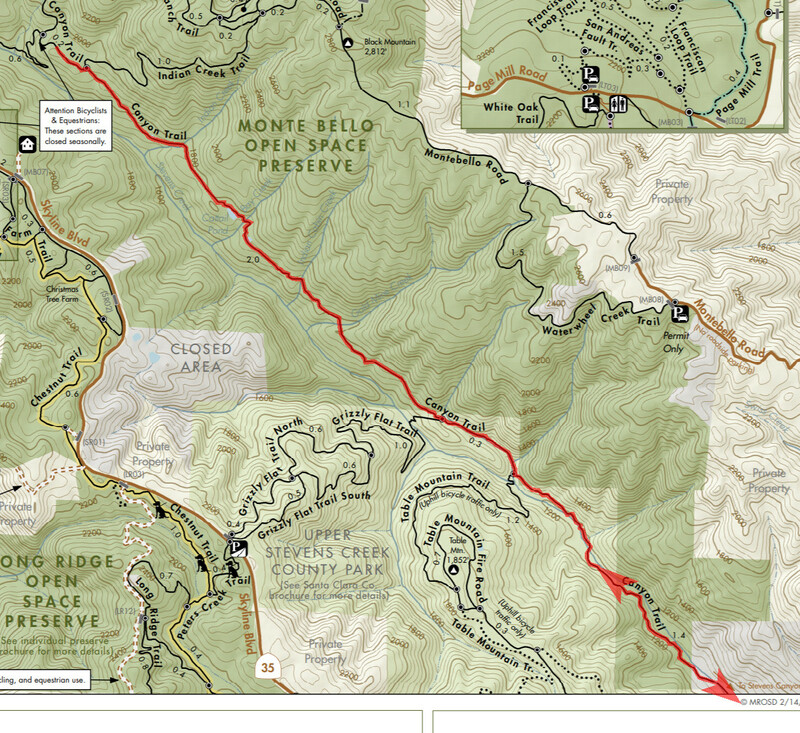 Right afer this, you pass by a panel with a trail map and the trail begins to make a better approximation of singletrack, which signifies your arrival at the Monte Bello Open Space Preserve. From here, once you crest a short and easy climb, a smooth and gentle descent will take you to an easy creek crossing. That is, "easy" unless you've never done a creek crossing on a bike before, at least. And if you haven't, this is a managable one to try for the first time. Based on the season, the water level fluctuates somewhat. But, I've seen it completely dry only once in several years of riding this trail, and never any deeper than 10 inches or so. There was only a single time when I've seen this crossing with too much water to cross without getting seriously wet, and that was during the almost-record-breaking rains of the winter of 2016-2017. What follows the creek crossing is the remainder of the brief singletrack portion of the ride, where you initially climb moderately, and then descend a little bit, before ending up on a fire road. This spot also happens to be near the branch-off point of Table Mountain Trail, which would take you up to Skyline Boulevard via Charcoal Grade, and then potentially into Long Ridge Open Space across that road. There's a medium-sized "ditch" that you also go through right here at this same spot. During wetter times of the year, this becomes a second creek crossing once in a while, but I usually find it dry. After this spot, the fire-road climbs and the uphill curves on the trail begin, punctuated by relatively flat portions. At least one of these has a grade around 20-22% at its steepest spot, and there are a number of others that exceed 15%. The first one of these arrives early and starts as a moderate climb where the trail surface is pretty loose and rocky, followed by a brief burst that's even steeper, by which time I'm usually already exhausted by the part that's leading up to it, so I've never been able to clear it fully. This is really the worst climb for a while, as you go further up along this trail. But then, the comparatively gentler climbs keep you working quite a bit as well. Like I said already, you don't have to turn back from where the particular route on this page indicates that you do. You can go as far up as you please. I should tell you, though, that after you pass the junction with Indian Creek Trail and get closer to the junction with Bella Vista Trail, another series of steep climbs greet you (and descents, which will become climbs on the way back...). After those, the fire road continues at a relatively managable grade all the way to Page Mill Road. When you decide you've had enough, you can turn back to reap all the investment you've made in slow elevation gain up to that point, by descending all the way back to the start with very little climbing. The list of possibilities for those who'd like to extend this ride is a long one. For those who like the trail portion of this ride but who'd like a meatier challenge, one easily recommendable option would be a loop that begins with a road climb up Montebello Road and that uses nearly all of Canyon Trail as the descent. Another way of extending the trail mileage of this ride that readily presents itself is the addition of some nice singletrack mileage in the trail network of Monte Bello Open Space Preserve. Additional options include Skyline Ridge and Russian Ridge right across Skyline Boulevard, and Alpine Road right across Page Mill Road.